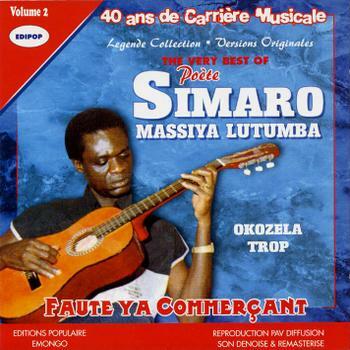 Simaro Lutumba is a legendary composer/guitarist from Congo. Known popularly as “Le Poete” because his songs contain deep thoughtful lyrics, his full name is Lutumba Masiya Simaro Ndomanueno. He is so good at analysing human nature that one would be forgiven for thinking he studied Psychiatry and Philosophy. He is considered by many as the greatest composer in the history of Congolese music. He mostly known as the trusted lieutenant and assistant band leader to Franco and TP OK Jazz. Lutumba Massiya Simaro Ndomanueno was born on March 19 1938. Prior to joining TP OK Jazz, Simaro started his musical career as rhythm guitarist at with Orchestre Micra. He initially joined TP OK Jazz in 1961. In those days band membership was fluid. So Simaro left to Join Congo Jazz. He returned to TP OK Jazz in 1963 when Congo Jazz became defunct. He stayed in TP OK Jazz except for a brief hiatus in 1986. Aside from Franco, he was the longest serving member. For most of his time at TP OK Jazz, he served as the band’s Vice President. While Franco was on his numerous trips to Europe, Simaro often stayed home and led the home based band. At its height, TP OK Jazz had two units. One that would go on tour with Franco and the other that would stay and play live concerts at Franco’s nightclub in Kinshasa. Simaro was also the main Chef d’Orchestre, providing input to all songs and arrangements by the band and offering suggestions on compositions by other singers. Simaro had been in TP OK Jazz for more than a decade before he finally captured the imagination of the public when he composed the song Mabele (The Earth) in 1972. Prior to that, he played second fiddle to other more illustrious band members such as Vicky, Mujos, Kwamy and solo guitarist Mose Se Fan Fan. The song Mabele was a poetic ballad about life’s problems and the inevitability of death. He sung: “We come from earth and we eventually return to the earth“. It is the song that earned Simaro the nickname “Le Poete”. The song was soulfully delivered by new recruit Sam Mangwana who had just joined from rivals Afrisa. 1975 saw Simaro compose one of his most popular songs named Mbongo-Money-L’Argent. The first version of this song was sung by Ndombe Opetum. It lamented the problems caused by money. Money divides families, ends friendships and causes a host of other problems. A second version sung by Djo Mpoyi was released two years later. That delivery by Djo Mpoyi is one of the most soulful deliveries yours truly ever heard. In 1978, Simaro’s career hit its lowest point when along with several other musicians, he was imprisoned at the infamous Makala prison due to two obscene songs that Franco had recorded. Simaro had not played any part in the songs but it was collective punishment. What is perhaps Simaro’s most famous song, Faute Ya Commercante (The business womans fault)was released in 1982 and sung brilliantly by Sam Mangwana. Simaro continued to release hit after hit, all of which became memorable hits. There was Cedou, Eu Benite, Mbanzi Ya Kamundele, and Nganda tosalake fete, win which Simaro describes a series of strange dreams. Many of these songs became all time classics. With his success, It seemed like he could easily venture out on his own and pursue a successful solo career. Indeed in 1986, he released an album outside the TP OK Jazz system. The hist song from that album, Maya was voted as Zairean song of the year for 1986. The release of that album created tension between him and Franco. When a friend’s sister passed away, Simaro composed the song Testament Ya Bowule in which he describes how he heard the bad news and how he struggled to explain to the two children of Bowule that their mother died. Towards the end of the song Simaro asks Heavenly Angels to take care of his sister as she enters a strange land. He then asks Bowule to pass his greetings to those who had passed on including their parents. When Franco passed away in 1989, Simaro became band leader of TP OK Jazz. He had reached an agreement with Franco’s family regarding revenue sharing and other legal issues. However in 1993, there was a major disagreement between band members such as Simaro on one side against Franco’s family and the singer Madilu on the other side. So Simaro and most of the band members left TP OK Jazz to form Bana OK (people of OK). Bana OK released several successful albums among them Trahison and Ingratitude, both released in the late 1990s. He continued to release successful albums even as he approached his 70th birthday. In fact one of his best efforts was the album “Proces” which had ten new songs and was released in 2004. He was still going strong in his 70s. Simaro passed away on March-30-2019 at a hospital in Paris, only 11 days after his 81st birthday. He had been convalescing at the hospital for two months. Before he passed on, he noted that he had accomplished his mission in life and set a good example for up and coming musicians. This entry was posted in African musicians and tagged Bana OK, lutumba simaro. Bookmark the permalink. 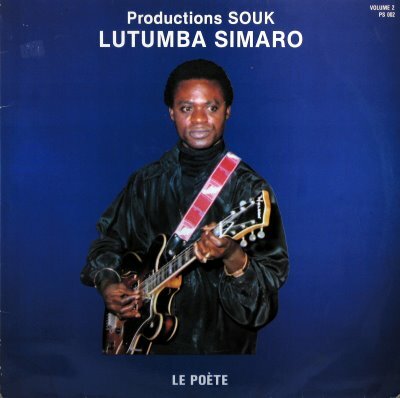 Lutumba simaro is a legend in the world of congolese music. This man was a beneficiary of l ordre nationale de leopard in mobutu s era of wich you ve never mentioned in your all text. a living legend.mundele asalaka mondoki ya koboma bato,kasi ya koboma verite asalaka te.